It is not uncommon for those living with incontinence to wear adult diapers and use other incontinence products. These types of products, though very helpful in protecting people from soiling their clothes and furniture, have their drawbacks. One of these drawbacks is the odor that they can cause after use. People may dispose of their incontinence products in a regular trash can, which can create an uncomfortable living environment and an issue with quality of life. This is why it is ideal for people with urinary incontinence to purchase an adult diaper disposal system. It's a good idea to keep extra refills on hand. Odor containment, sanitary and hands-free operation make the Akord a great product, but so does its appearance. The appearance of a waste disposal may be a concern for some people, as it may not fit in with their home decor. With the Akord this is not a concern because it actually has a pleasant, sleek appearance that allows it to fit in perfectly with any interior decor and remain discreet. The refill is easy to replace when empty. 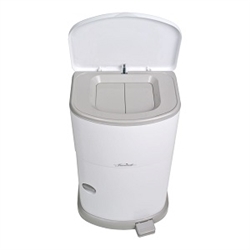 The Diaper Pail comes ready to use right out of the box with one refill already installed for you. This product really fills the bill. It's convenient and easy to use. The only negative (very slight) is once in a while when starting to remove the bag the door would come off. Now what I do is use one hand to keep slight pressure on the top while starting bag removal with the other hand. Once the bottom of the bag is on the floor I can use both hands. But each refill lasts a long time.